His story started to circulate almost immediately after the events of 14 July. The English Dr Rigby in his Journal - probably with reference to Whyte - reported that a "Count D'Auche" had been found on the morning of the 15th in "one of the deepest Dungeons", where he had been confined for 42 years. An anonymous pamphet claiming to be a letter written on the 15th described a "Count d'Estrade", "beautiful man" of sixty-five to seventy years who had been accused of Lèse-majesté and sentenced to lifelong imprisonment. Other pamphlets mention "a harmless old man" who had been imprisoned for "near thirty years" and a "Comte Straze" who had languished for "thirty-two years" and whose "beard reached his stomach". By the end of August the prisoner had a fixed name the "comte de Lorges". His image appeared in numerous prints and broadsides. "Deliverance of M.le Comte de Lorges"
The key publication in the formation of the myth was the journalist Jean-Louis Carra's little book Le comte de Lorges which appeared in the middle of September 1789. 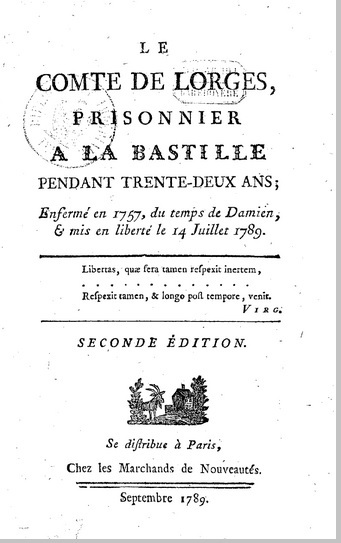 The title informs the reader that the comte had been "a prisoner in the Bastille for thirty-two years, from the time of Damiens until his release on the 14th July 1789". He was described as "an old man whose beard descended to his waist, made venerable by his sufferings and the length of his capitivity". Carra claimed to have heard his story personally as he was led to the safety of the Hôtel de Ville. Like Latude, the comte had been imprisoned for an indefinite period of time at Madame de Pompadour, supposedly having complained about the corruption at Court; his only crime was his "republican soul" and his desire to see virtue triumph over vice. The archetypal forgotten prisoner, he is made to lament: "The years flew by and brought no change at all in my fate; sad and in low spirits I let my days pass in bitterness and sorrow and cursed Despotism and its accomplices". Wearied by returning to a world he no longer recognised, the comte de Lorges (conveniently) died soon after his liberation. 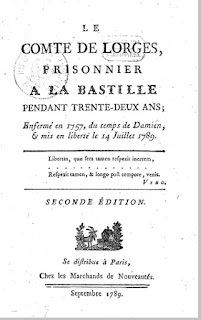 Apart from Carra's pamphlet the main impetus behind the comte de Lorges story was the publicity machine represented by the Bastille's enterprising demolition contractor Palloy In the summer months of 1789 visitors flocked to the fortress in their thousands, to tour the horrors of the Bastille in the company of accredited guides in Palloy's employ. They were shown damp dungeons, instruments of torture, remains of skeletons and "death machines unknown to man". The press even published inscriptions written on the walls of the cells. In August 1789 Mauclerc, an office scribe from Chalons in Burgundy, composed a pamphlet Le Langage des murs, ou les Cachots de la Bastille devoilant leurs secrets. (http://gallica.bnf.fr/ark:/12148/bpt6k6547269c) in which he claimed to have discerned the imaginary comte's name etched on the wall of a dungeon together with a suitably despairing Latin quote. Some visitors were of course sceptical. Louis Abel Beffroy de Reigny remarked that he had been shown several different dungeons, each of which workers claimed had been occupied by the "comte d'Orges" (p.82). 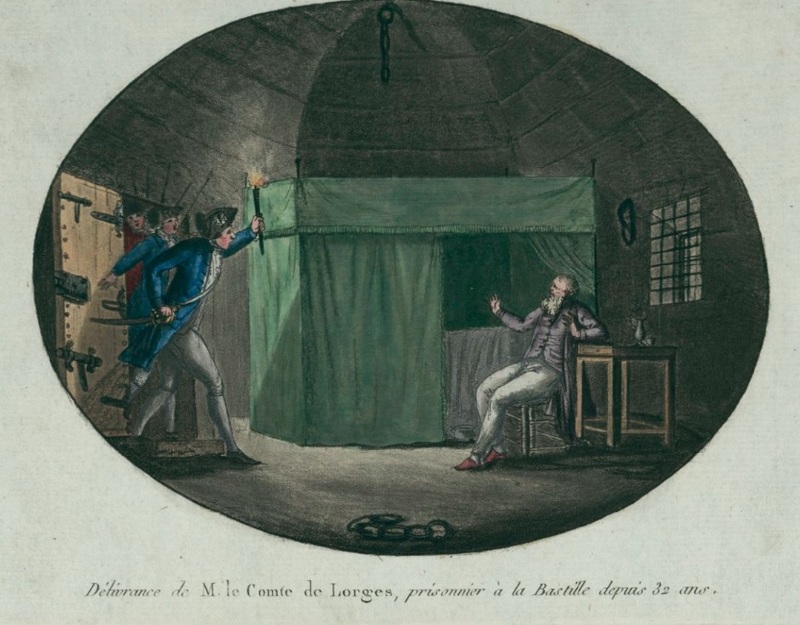 Louis-Pierre Manuel noted that he had been shown the comte de Lorges's dungeon and seen a waxwork by Curtius laden with chains, but the registers of the Bastille and the depositions of the turnkeys mentioned only seven prisoners - the comte couldn't be identified with Whyte, who had been in the Bastille only since 1784 and was a madman (p.132-3). La Bastille dévoilée (1789) attributed to Louis-Pierre Manuel or "Charpentier"
On 5th December 1790, at the instigation of the local deputy Cigongne, the town of Saumur was ceremonially presented with a block of stone from the Bastille to honour Aubin Bonnemère, a soldier in the Royal-Comtois regiment who had taken part in the events of 14th July. (His chief claim to fame was that he had rescued Mlle de Monsigny, daughter of the commander of the Compagnie des Invalides.) The Vainqueurs de la Bastille provided a written certification that the stone came from the very dungeon "in which the comte de Lorges had been imprisoned for thirty-two years". According to at least one 19th-century account Bonnemère himself later claimed to have personally liberated the comte from his "gloomy cell" . 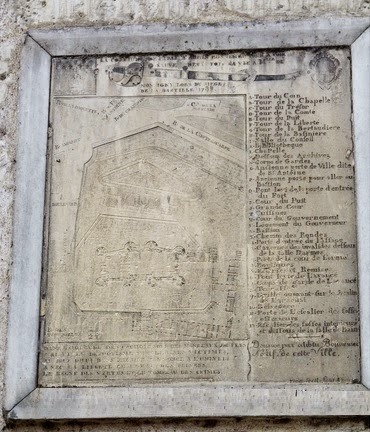 To the intense irritation of latter-day Vendéens, the stone - engraved with a plan of the fortress and some boastful verses by Bonnemère - is still to be seen embedded in the wall of Saumur's 16th-century town hall. By the beginning of 1790 Curtius already had an effigy of the comte on display in his waxworks. In later years it was the first figure of the Revolutionary period for which Madame Tussaud herself took full credit. The 1820 Tussaud catalogue even claimed that she had met the comte: "The existence of this unfortunate man in the Bastille, has by some been doubted. Madame Tussaud is a living witness of his being taken out of that prison, on the 14th July 1789. Madame T. was then residing in the house of her uncle ...The Count was bought to the house, but his chains had been taken off." Her Memoirs of 1838 describe how the prisoners were discovered in dark dungeons beneath the Bastille. The "most remarkable" among them, "he was brought to her to take a cast from his face, which she completed, and still possessed in her collection...He had been thirty years in the Bastille and when liberated from it, having lost all relish for the world, requested to be reconducted to his prison and died a few weeks after his emanicipation" (see Bindman, p.40-1). "To enter the Chamber of Horrors rather late in the afternoon, before the gas is lighted, requires courage. To penetrate through a dark passage under the guillotine scaffold, to the mouth of a dimly-lit cell, through whose bars a figure in a black serge dress is faintly visible, requires courage. Your eye-witness entered, on the principle which causes judicious persons to jump headlong into the sea from a bathing-machine instead of gradually and timidly emersing themselves from the ankle upwards. Let the visitor enter this very terrible apartment at a swift pace and without pausing for an instant, let him turn sharply to the right, and scamper undert he scaffold, taking care that this structure – which is very low – does not act after the manner of the guillotine it sustains, and take his head off. Let him thoroughly master all the circumstances of the Count de Lorge’s imprisonment, the serge dress, the rats, the brown loaf – let him then hasten up the steps of the guillotine and saturate his mind with the blood upon the decapitated heads of the sufferers in the French Revolution – this done, the worst is over." David Bindon, The shadow of the guillotine: Britain and the French Revolution (1989 Exhibition catalogue). No 25." 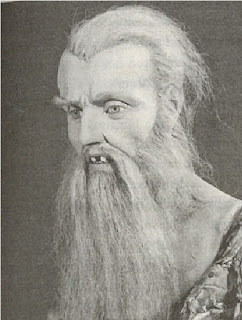 Wax model of the head of comte de Lorges..."